Product prices and availability are accurate as of 2018-12-14 23:41:23 EST and are subject to change. Any price and availability information displayed on http://www.amazon.com/ at the time of purchase will apply to the purchase of this product. Get the Max out of your Oscillating Tool with the New Dremel MM495 Universal Accessory Kit. This kit features Dremel's newly designed Universal Quick Fit interface system, for fast accessory changes and compatibility with most oscillating tools on the market. This 13-piece mega kit provides do-it-yourself enthusiasts and pros with a wide range of applications for any Multi-Max oscillating tool. A reusable storage case is included for storing this collection of oscillating accessories. 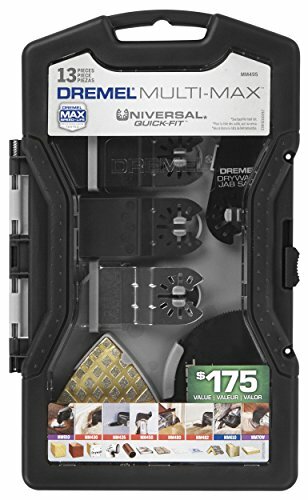 The Dremel MM495 13-Piece Accessory Mega Kit Includes: (1) MM430 Hook Blade, (2) MM435 Jab Saw Blades, (2) MM480 Wood Flush Cut Blades, (1) MM482 Wood & Metal Blade, (2) MM450 Wood & Drywall Half Moon Blade, (1) MM610 Flexible Scraper, (1) MM910 Diamond Abrasive Paper, and 3 Sanding Sheets (60, 120, 240 grit).